John the Baptist foretold of the arrival of Christ, and he said even though he baptized with water that one mightier would baptize with the Holy Spirit and with fire. 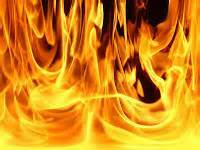 HE would be gathering wheat (His people) but the chaff (Not of HIM) would be burned with a fire unquenchable. The fire spoken of here is the word of God. (Luke 3:16-17). We as Christians find early that when we speak the word that many are offended by it and we are reproached and hated, yet we are truly blessed to be able to take the gospel to dry and weary land that’s in a famine for to hear the truth of the word. (Luke 6:22). Blessed are ye, when men shall hate you, and when they shall separate you from their company, and shall reproach you, and cast out your name as evil, for the Son of man’s sake. Jeremiah felt just as we do when he spoke Gods word and are mocked or shunned that maybe it would be better not to speak it, and maybe he should not speak it at all. Jeremiah said that HIS (Gods) word was as a burning fire in his heart, just as we too are moved to speak when God places something on our heart! (Jeremiah 20:7-9). O Lord, thou hast deceived me, and I was deceived; thou art stronger than I, and hast prevailed: I am in derision daily, every one mocketh me. For since I spake, I cried out, I cried violence and spoil; because the word of the Lord was made a reproach unto me, and a derision, daily. Then I said, I will not make mention of him, nor speak any more in his name. But his word was in mine heart as a burning fire shut up in my bones, and I was weary with forbearing, and I could not stay. In time there will be a third part left in the land after all mans rebellion, and it will be a people that God will refine as silver and say they are HIS people. (Zechariah 13:8-9). And it shall come to pass, that in all the land, saith the Lord, two parts therein shall be cut off and die; but the third shall be left therein. And I will bring the third part through the fire, and will refine them as silver is refined, and will try them as gold is tried: they shall call on my name, and I will hear them: I will say, It is my people: and they shall say, The Lord is my God.